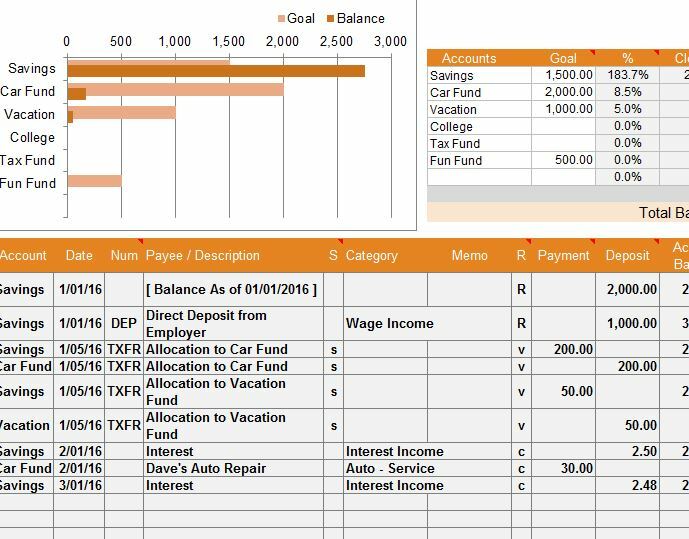 Keeping track of your finances has been made simple again with the Financial Account Register template. The free document allows you to enter your expenses and the dates in which they were incurred then casually list the amounts for them. This template simply gives you a convenient way to stay on top of your financial information. The free document even provides you with helpful visuals that will display where your money is being spent on a regular basis. You can now take the guesswork out of your financial assessments by downloading this free template today. You will need to download the Financial Account to get started. You can do this by simply clicking the link provided for you at the bottom of this page. The next step will be to enter your account information, particularly the balances in the upper-right hand corner of the template. You will also enter the name of your account and your goal (how much you want in this account). Scroll down to the main table below. The first row of this table lists all the things you will enter into each column. For each expense or deposit, you will list the account, date, description, category, etc. The Financial Account will take all the information you give in this section and give you an accurate assessment of your goals back at the top of the page. You can see from the example, that this person exceeded their goals after a while and now has almost twice the amount of money in their accounts than they initially planned on saving up. The “Category Summary” table is also a convenient tool that will list any special details that might attribute to loss of income, such as tax or needed repairs for your car. The Financial Account will take these things into account first before providing you with the above percentage and graphs that illustrate your progress.